How to make a bootable Linux Ubuntu Usb? I'm a really big fan of Ubuntu and today I decided to show you how to make a bootable usb stick that you can use for installing or using it portable. Download the tool for that by clicking Here! Run the tool and click I agree. Now from Step 1 choose the distribution you want to install. In case Ubuntu. On Step 2 choose the downloaded OS. Step 3 just select the usb stick. If your stick is not listed, please check the "Show all drives"on right side. If you have any questions be free to ask them below. 2. Set the program as default for gif files. If you have any questions, please write a comment below. Are you annoyed from slow running OS? After minutes you will learn how to make your OS run faster... and here is the solution. 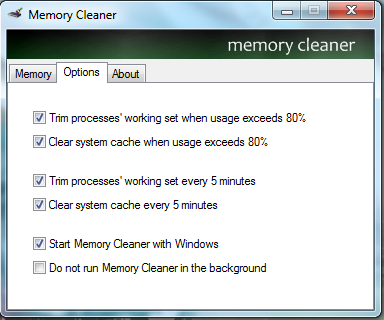 It's all about a software called Memory Cleaner which is a stunning program. Just install and run the program. Hello everyone. Today I'm going to tell you how to create a bootable DVD or USB for Windows 7. 1. You have to download this software: Download from here! 3. Open and after that you'll see "Browse" button. Click there! Are you annoyed of ads from youtube when you are watching videos on YouTube? Then you're in right place to find out how to remove it and enjoy watching your favorite videos. You are still here?! Yes, you want to know how to remove them. Ok, it's really simple. If you readed my older post, you should know that I'm using Google Chrome and this will gonna work only with Google Chrome! Now! All you need to do is to add THIS simple extension to your Google browser. And thats all. This extension works only in YouTube, if you want to remove ads from other web pages you'll need another extensions for which I'll talk about another time. If you have any problems or want to ask questions, you can do it from "Comments" area below. Do you want to know how to make your browser to scroll smooth and better? You need to add THIS extension to your browser. Important: We recommend you to restart your browser after adding the extension! After restart you can Enable/Disable this extension from the top right on your browser (Wheel icon). Important: That works ONLY on Google Chrome. To do this, you need to add THIS extention on your Google Chrome browser. When you add, I recommend to restart your browser and after that everything should work properly. You will see a new button in top right of your browser. When you click it, you'll be able to change prefered quality and size for you. In this post i will show you how to fix your problems with Unicode programs. For example, if you run video/movie (with Bulgarian subtitles) and see words from unknown language that means you have to change settings for Unicode programs. Important: If you live in non-cyrlic country, you might be no need to change this settings. In this window you see all the countries and languages… I’ve choosed Bulgarian, because I live in Bulgaria and some softwares need to change system locale to show them. Today I will show you how to format your Flash Drive correctly and fix errors. First open a command prompt window with administrative rights. You can do this by going to the Start Search and typing in command prompt or cmd and then by right clicking on the command prompt icon and select Run As Administrator. Then enter this command “list disk” without the quotes to display all active disks on your machine. Next you want to use the “Select” command to pick your flash drive. For me I will use “Select disk 2” since 2 is the disk number for my flash drive. Next you want to enter “clean” with no quotes. Next type in “create partition primary” with no quotes. Next type in “Active” with no quotes. Here comes the fun part formatting it. You can chose any file system that is supported by your flash drive. I am going to select ntfs, which is supported by my flash drive. You can select fat32 or fat16 if you need those type of formats. Type in this command without quotes “format fs=ntfs label=”PUT YOUR DESCRIPTOIN HERE” quick. Just replace ntfs with either fat32 or fat16 to format the drive with these formats instead. Then type in Assign and then Exit. Now you have a formatted flash drive! That is it! Now you can show off your geeky skills by using this diskpart instead of the graphical user interface to format your flash drive. Have any questions feel to leave a comment below or post them in the comment section below. Today in this post, I wish to show you how to remove lag on videos/movies running with H264 codec. Important: This method works with The KM Player, not tested in others. You can try it with other ones, if you want. 5. Again from left choose Decoder Usage > External Video Decoder > System Default for all. After these steps, if you have any problems or questions you can ask from comment below.